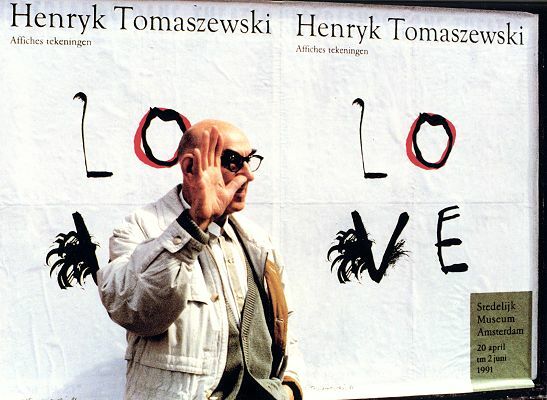 Henryk Tomaszewski, the most admired and most influential polish poster designer of the 20th century died in Warsaw on September 11, 2005, in the city where he was born on June 10, 1914. W Warszawie zmarl Henryk Tomaszewski, najslynniejszy mistrz polskiej szkoly plakatu. Mial 91 lat. Cale zycie byl zwiazany z Warszawa: tu urodzil sie, uczyl i studiowal malarstwo w Akademii Sztuk Pieknych. Na tej samej uczelni, przez 33 lata, prowadzil pracownie plakatu. Jego odejscie na emeryture w 1985 roku zapamietali w ASP wszyscy. Najwiekszemu gwiazdorowi naszej szkoly plakatu dopiero na 85. urodziny zorganizowano w Warszawie pierwsza indywidualna ekspozycje. Przedtem prezentacje dorobku Tomaszewskiego odbyly sie w Tokio, Amsterdamie i Berlinie. 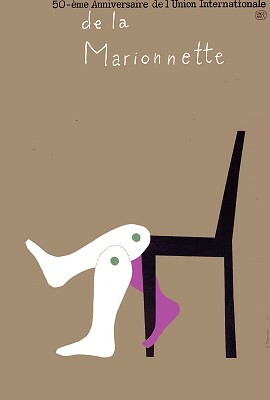 Zdzislaw Schubert, the distinguished curator of the poster collection at the National Museum in Poznan wrote in his preface in the catalogue of the Tomaszewski exhibition at the Umeleckoprumyslove muzeum in Prague (1994): It would be difficult to overestimate the part Henryk Tomaszewski has been playing in the history of Polish and world graphics. The artist has been active not only as the designer of many posters, as the author of illustrations and satirical drawings, but also as a teacher. And he has come to be recognised as an unconventional personality in both those areas of activity. Many eminent Polish designers have emerged from his workshop. Young graphic artists from many European countries have come to him to take undergraduate and post-graduate courses. Today, they frequently belong to the topmost poster painters in their countries, and abroad. What does the phenomenon of that artist consist of, an artist whose unruly graphic temperament and energy constantly lead him to seek new paths, new solutions and who infected his associates with his passion? It is not easy to answer that question, as Tomaszewski escapes all stereotypes of classification and analysis. And although his work was bred in the atristic tendencies of the day, his independence of thought and imagination and his independent attitude to his milieu made him break through the canons of design surrounding him. But at the same time, it has to be recognised that in spite of being such a strong individuality, he did not impose his way of thinking upon others, particularly in matters of craftsmanship. Thus, apart from a couple of attempts, one would in vain seek any imitators of his style among his pupils. Jan Lenica, who was Tomaszewski's assistant from 1954 to 1956, wrote in 1993: For me the decisive thing is contributing to any artistic domain. Henryk Tomaszewski has contributed something that is absolutely his own and inimitable. Something quite Polish and Warsovian. A part of himself. We could define it as his style but does not like that notion. He has his disciples but no imitators because you cannot imitate him. Henryk Tomaszewski is a poet, and that's all, folks!